The octopus and its cousins are known for many things: shooting ink as a defense mechanism, inspiring decades of stories about deep sea monsters, and being among the most masterful escape artists in the animal kingdom. Thanks to the makeup of an octopus's body, it can squeeze through a hole of virtually any size; Octopi in the natural world use this ability to hide in rocky crevasses where they wait to ambush prey. Scientists at the Biorobotics Institute in Italy have now mimicked this ability with robotics. Together, they've designed a machine known as PoseiDrone. Named for the sea god Poseidon, Poseidrone may be one of the most flexible robots in existence, with nearly 90% of its body comprised of soft materials. What this means is that - just like an organic octopus - PoseiDrone is capable of navigating tight spaces beneath the waves, propelling itself by expelling water from its body. This makes it ideal for both underwater repair and exploration. In addition, it could also see use as a rescue droid, as its arms are large enough to wrap around a human - and the robot is presumably strong enough to carry them above the waves. 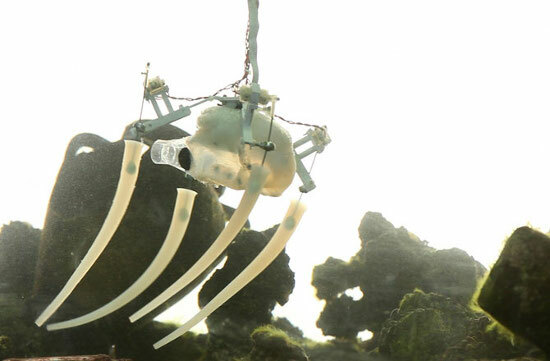 Researchers Francesco Giorgio-Serchi and his colleagues used 3-D printing technology to create PoseiDrone, and intend to utilize the same technology to further advance the field of soft robotics. Using the printer, they're able to quickly and efficiently design, experiment, and modify. The ultimate goal is to develop PoseiDrone into a robot that's capable not only of infinite motion and flexibility, but also in possession of an Octopus's unique nervous system, which features an advanced nervous system with a brain in each tentacle. PoseiDrone is still in the research phase of its development. Giorgio-Serchi and his team are still exploring the limits of what soft robotics can do; they're currently looking into flexible electronics to power PoseiDrone. Ultimately, they're looking to make a robot that's completely soft-bodied; both far more flexible and durable as a result. "Without the soft part," explained Giorgio-Serchi to the New York Times, "it would just be a pile of motors and cables." It's Five O'Clock Somewhere... But Where?